The Fell Pony Museum: Controlling the Border Fell Pony Museum: Welcome! The Romans moved north to occupy the northern part of Britain circa CE 79 and remained in control until ~CE 420. They kept the borders between northern tribes who were fully under Roman rule (eg, on the western edge, the Brigantes and Carvettii), and the more northerly parts of the island - roughly what is now Scotland. The parts north of the borders were not officially controlled but were fairly prosperous and so "worth keeping an eye on". The borders controlled movement of people and trade between the two areas. The best-preserved and most famous border is Hadrian's Wall. There were others such as the Antonine Wall which were further north. The garrisons on Hadrian's Wall were manned by auxiliary troops who came from many areas of Europe. French, Dutch, German, Polish, Spanish or eastern European cavalrymen were posted to the Wall area and to other areas around Northern Britain. They presumably had the job of maintaining law and order among the "wretched little Britons" (described in the Vindolanda tablets as "Brittunculi"). At least some of these units must have ridden to their postings on war horses from their own home area. Foreign horses of several types were deduced from archaeology in Northern Britain in the early years of the 20th C, and the evidence to date suggests that an average height for horses in Britain was around 13hh to 132hh (Johnstone). Donkeys and particularly mules - "iumenta" - were also in use. A cross between any of these the French, Dutch, German, Polish, Spanish or eastern European military mounts and the existing pony stock might have produced an animal closer to "horse size". However, anything over 13.2 hands high is not suited to the conditions on the northern fells. 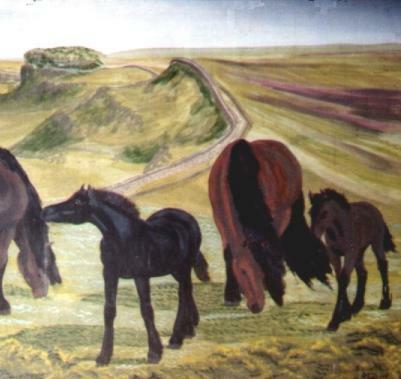 Big animals could not survive on the open fell without extra feeding, so by natural selection, despite any foreign inputs, the local stock is likely to have stabilised as pony-sized (Richardson). There was no distinction made between "ponies" and "horses" at that time. Animals were described by their suitability to various jobs, such as pack work, draught or riding; so they were types rather than breeds. There may or may not have been a settled "stamp" of animal in the north of England but any assertions on the matter would be speculative.